Melon mambo card base and Soft Suede, now I tried the grid technique which I haven't tried for ages, it is very easy to do if you have one of these fancy score boards with lots of grooves in but equally easy to just use your Fiskars trimmer with the scoring blade. Simply score a pattern at equal intervals in two directions. I have used a sponge dauber and soft suede ink to add some definition and what you cannot see is the fabulous shimmer paint applied to this layer, very pretty. 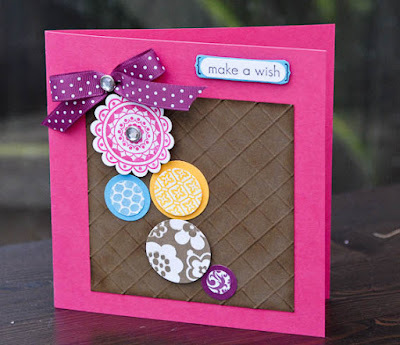 I love this stamp set Circle Circus and I have used it quite a lot recently . I got the idea of the different circles in different colours from a few cards in the gallery at Splitcoast stampers, Melon Mambo, tempting turquoise, summer sun, rich razzleberry and soft suede. Some circles have matted layers and are raised on dimensionals. I was very pleased with this card . Jo I hope you had a fabulous birthday and I am sorry I am a bit late in announcing it on here. After making this card a light bulb moment went off and decided to make some bookmarks for my Virtual club members. Perfect for the Summer holidays coming I thought although I cannot tell you how much time they took me!!! I made 50 of them gulp. Same colours more or less this time on the soft suede base and a bit of Pumpkin pie was added. How cute is the spotty ribbon LOVE IT!!! Ok WE HAVE 3 WINNERS for my pendant giveaway. YAY CONGRATULATIONS LADIES please let me have your addies and I wills end those onto you. Thank you very much to all of you that left me some really sweet comments. Oh Monica I forgot you had that cold and all those bookmarks you made. I can only say that it is more lovely in real life and VERY much appreciated. Love the card too, must try that grid effect. I love your circles - all the colours are gorgeous and I must order some of that sunshine sun - its yummy. 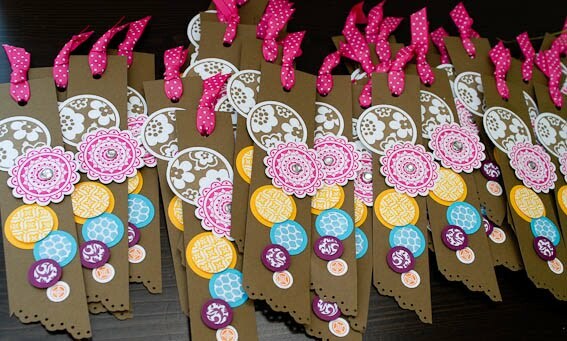 I love the bookmark you made me - wow you are a star for making so many! the bookmarks are even scrummier in real life!! hope you're feeling better soon honey! Oh what a gorgeous card Monica, how can you talk of getting bored of those wonderful colours! !